The National Space Society takes great pleasure in awarding a 2014 Space Pioneer Award in the Science and Engineering category to Dr. John S. Lewis. This award is in recognition of his major contributions to the study of the formation and chemistry of asteroids and comets, and his effective work in explaining and promoting both the risks and benefits asteroids offer through his publications. NSS will present the Space Pioneer Award to Dr. Lewis during the dinner on Thursday, May 15, at its annual conference, the 2014 International Space Development Conference (ISDC). The conference will be held at the Sheraton Gateway Hotel in Los Angeles, CA. and will run from May 14-18, 2014. Dr. Lewis is Professor Emeritus of Planetary Sciences and Co-Director of the Space Engineering Research Center at the University of Arizona. After his degree programs at Princeton, Dartmouth, and University of California at San Diego, he taught space science and cosmo-chemistry at MIT, before moving to the University of Arizona. His work on the chemistry and composition of asteroids and comets has resulted in a series of significant scientific publications. He has written 19 books, including graduate and undergraduate texts and popular science books. He has authored over 150 scientific publications. His clearly written popular books, (such as Rain of Iron and Ice: The Very Real Threat of Comet and Asteroid Bombardment; Mining the Sky: Untold Riches from the Asteroids, Comets and Planets; and Worlds Without End: The Exploration of Planets Known and Unknown) have contributed in a major way to public understanding of space dangers and space resources. He began publishing on this topic when most people could not even conceive of using space resources. It has always been a risk for professional scientists to write or communicate to the public though the popular media, even though competent communication in this area is always badly needed. With the advent of both miniature space probes (allowing inexpensive investigation of asteroidal resources), and the imminent availability of reusable rockets (to reduce launch costs and thus allow high mass space operations), the prospect of actual recovery and use of space materials is now much more believable. His association with Deep Space Industries as Chief Scientist underscores the new reality. His service as a member of the NSS Board of Governors is also noted with appreciation. 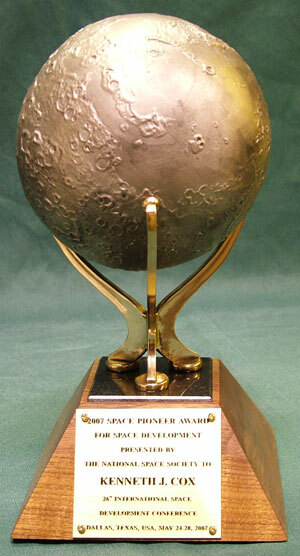 The Space Pioneer Award consists of a silvery pewter Moon globe cast by the Baker Art Foundry in Placerville, California, from a sculpture originally created by Don Davis, the well-known space and astronomical artist. The globe, as shown at right, which represents multiple space mission destinations and goals, sits freely on a brass support with a wooden base and brass plaque, which are created by Michael Hall’s Studio Foundry of Driftwood, TX. There are several different categories under which the award is presented each year, starting in 1988. The NSS Awards Committee has been chaired by John Strickland since 2007 and its members seek prestigious award candidates on a continual basis. About the ISDC: The International Space Development Conference (ISDC) is the annual conference of the National Space Society bringing together NSS leaders and members with leading managers, engineers, scientists, educators, and businessmen from civilian, military, commercial, entrepreneurial, and grassroots advocacy space sectors.